Finding a place for new-school MMO design in Old School Runescape. Despite thousands of logged hours, I cannot begin to imagine how to design a raid for Runescape. Runescape! Of all games! And that’s Old School Runescape, for the record, the endearingly grindy game with which I and countless other former high school students with too much free time on their hands are so well acquainted—and which tens of thousands of players continue to enjoy on a daily basis. For the past few years, Jagex has been mulling over that exact problem. How do you make a raid for Old School Runescape, a game which, historically, delights in shirking the MMORPG status quo? This past January, they unveiled their answer: the Chambers of Xeric, Old School’s first full-fledged raid. It’s surreal to see Twitch streams and YouTube videos of Old School players fervently puzzling out the mechanics of a game whose strategic depth I remember capping at clicking something, or for the truly advanced, clicking something else. And it’s just plain fascinating to see how Jagex has turned raiding on its head, cutting and modifying dungeon de rigueur to produce a unique experience that absolutely emanates Runescape. Unable to make sense of the bosses and puzzles by peering over the fence, I spoke with Matthew ‘Mod Mat K’ Kemp, Kieran ‘Mod Kieren’ Charles and Ashleigh ‘Mod Ash’ Bridges of the Runescape development team to take a proper tour of Xeric’s creation and challenges. To achieve that variety without deviating from Runescape’s core simplicity, the team adopted an unusual design philosophy very early on: modular challenges. Chambers of Xeric consists of eight boss rooms, four challenge rooms rooted in skills like thieving and woodcutting, and one final boss, The Great Olm. But Olm himself is the only constant. Each raid is a randomly generated combination of about half of those 12 rooms, meaning you’ll rarely run the same raid twice. Although unconventional, this approach actually made some things easier on the team. Jagex did something similar in 2010 with the dungeoneering skill of Runescape 3, the mainline version of the game, which also tasks players with completing a gauntlet of boss-punctuated challenges. Importing those elements to Old School was intuitive, but not quite so cut-and-dry. The biggest trait Xeric inherited is its crafting system. Unlike with dungeoneering, players can bring whatever gear and items they want into the raid. But they will inevitably run out of supplies, usually well before even reaching Olm. At that point, players have to restock mid-raid using the resources around them. This ties into those non-combat rooms, which are actually one of Xeric’s most striking features. Runescape lacks the classes and roles of games like World of Warcraft and Guild Wars. It was clear from the get-go that there would be no tanks, healers or DPS in this raid. Instead, Xeric allows players proficient in particular skills—hunting, fishing, herblore, farming and so on—to contribute to the party by preparing supplies. You might not be a designated healer, but if you have the highest herblore in your team, you’re going to craft the best potions. The same goes for farming the herbs to make those potions, or catching the best fish for a skilled cook to prepare. Xeric is virtually impossible without collecting these raid-specific resources, so by proxy, you’ll still wind up healing or buffing your teammates. This raid is not about the skills on your hotbar or the stats on your armor; it’s about what you’ve done with your character, the skills you’ve leveled and learned. This frames an elegant solution to one of Runescape’s central limitations with regards to raiding, and it reinforces that Xeric is high-level content while motivating, rather than intimidating, low-level players. “So much of Runescape is about achieving goals,” Charles said. “As much as it might be a goal to reach level 99 woodcutting, what raids has done for us is given an aspirational goal that is actual content to achieve and then have fun with. We’ve got this system that we believe players are having a lot of fun with, and they want to try to reach that to get that better money-making method or just to enjoy it. “It gives you an actual reason to say, ‘I want to get 90 fishing—so I can get the best fish in raids.’ It’s very complementary to the rest of game,” he added. Making the idea of end-game PvE work within Old School was a huge part of Xeric’s development. Having settled on modular design and skill-dependent challenges—some of which were cut for the sake of releasing Xeric at the start of 2017—the team moved onto designing bosses. 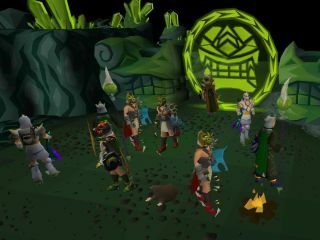 To help build the depth and difficulty expected of a raid encounter, the team leveraged the flexibility of Runescape’s players to work around the limits of the game. Take the Muttadile boss. It plays out like a traditional tank-and-spank at first, but when pressured, the Muttadile will devour the aptly named meat tree in the corner of its arena, which will heal it considerably. To prevent this, teams can have players with high woodcutting cut down the tree outright, denying the boss any healing. But that team could also have one player bring in ancient spells capable of freezing the boss in place away from the tree. The Great Olm, in particular, is a masterclass in Runescape mechanics. The three-stage encounter pushes the game’s combat triangle to its limits: players must damage Olm’s left claw with melee, his right claw with magic, and his head with ranged attacks, all the while dodging volleys of explosive crystals raining overhead and pools of poison bubbling underfoot. More interesting are the attacks which force players to cooperate and communicate on the fly. For example, Olm frequently marks two random players. After a few seconds, those two will take considerable damage unless they’re standing near one another, so players constantly have to locate and move to one another during the fight. Olm can also brand several players with a burn which will infect and damage nearby teammates, so at other times players have to spread out. This makes for a heady mix of repositioning that mirrors the tried-and-true “floor is lava” mechanics seen in dozens of other raids. The ease with which Xeric assembles these elements into a cohesive raid is largely thanks to Jagex’s development process. As I learned when I first spoke with Kemp about Runescape’s ever-exciting Deadman Mode, the studio values passion over position. Charles, for instance, is a long-time fan of boss encounters, so he took the reins on Olm’s design. Meanwhile, the artist in charge of designing many bosses also contributed greatly to their mechanics, which, Kemp says, is why they flow so well. Jagex has also made community feedback a priority with Old School. (After all, the game was only released because nearly 500,000 people asked for its return.) On top of play testers, it’s thanks to vocal players that the raid came so smoothly. The day after Xeric’s launch, the team put out a sizeable patch addressing minor grievances day-one raiders had raised. Monitoring feedback is one thing, but studios don’t put all hands on community deck for just any update. Jagex was anxious about Xeric’s reception, and rightly so. A raid was the last thing many people expected to see added to Old School Runescape. It was a gamble. It paid off. Xeric has been quite popular with players, and it dominated Twitch on the day of release. So, naturally, the team isn’t opposed to doing more raid content. In fact, Bridges says, they’re keen to further capitalize on Xeric’s modular design and release more challenge rooms, maybe even revisit some of those skill challenges which didn’t make the release date. But even in its current state, Xeric, like Deadman Mode before it, exposes a bolder side of Runescape too often missed by those out of touch with the game.